In an effort to identify the challenges Bostonians face regarding voting rights and election administration, the National Commission of Voting Rights held a hearing on Monday with a panel of specialists and testimony from residents voicing their experiences in voting at precincts in Massachusetts. 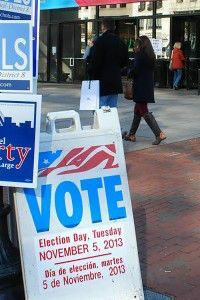 The NCVR, organized by the Lawyers’ Committee for Civil Rights Under Law, is conducting hearings like Monday’s, which was held at Suffolk University Law School, in 25 locations across the country in order to recognize what changes need to be made to ensure voting equality. John Dunne, panelist and former assistant attorney general for civil rights, said one problem is that people who are eligible to vote fail to register because the registration process is not easily available. At the end of the hearings, the NCVR will publish two national reports: one on voting discrimination issues in states across the country, and one on election administration, said Meredith Horton, organizer of the committee. Both of the reports will be available for policy makers, advocates and voters to help educate the public and support legislative reform. Dunne said the reports are important because they will bring to light the discriminatory practices that take place at polling locations that affect minority groups. “Our goal is to show that there are very real, serious, deeply imbedded discriminatory practices engaged in, which interfere with the rights of minorities and other protected groups from voting,” he said. Elainy Mata, a sophomore at Suffolk University who served as a poll worker during the 2012 presidential election and this fall’s mayoral primary, spoke about some of the discriminatory practices she saw at her polling location in Roxbury where she worked as a Spanish interpreter. Chris Robarge, 32, of Worcester, a member of the American Civil Liberties Union of Massachusetts, said certain abuses stem from the role of poll observer, a person whose part is to help voters navigate through precincts and the voting process. Robarge recalled one specific incident where the votes of Hispanic voters were removed from a pile of absentee ballots by a poll observer. Jonathan Simon, a representative from the Election Defense Alliance, said it is important to pay serious attention to the way votes are counted because without that, discussing access, qualification and voter identification can be rendered useless. All of these accounts and testimonies on issues facing the voting system will be recorded and used to push for reform, said Tyler Crosby, an organizer of the committee.